CREATED BY Dr IWAN S FROM HIS PRIVATE VINTAGE BOOK COLLECTIONS, THIS IS THE PREMIUM INFO, IF THE COLLECTORS WANT TO HAVE THE COMPLETE BOOK ABD ILLUSTRATION PLEASE CONTACT EDITOR, AFTER THE ASDMINISTARTION FEE OKEY, THE COMPLETE E=BOOK WILL SEND STRAIGHT TO YOU VIA YOUR EMAIL, FOR INDONESIAN COLLECTORS WE CAN SEND IN CD-ROM VIA TIKI . READTHE SAMPLE OF THE E-BOOKS. BELOW. @COPYRIGHT Dr IWANS 2010. DRAWINGS OF COSTUME AND SCENERY. I wish the readers of these pages to understand that it has been with no desire to appear before the public as an author that I have published this Narrative of the Proceedings of Her Majesty’s ship Samarang during her last Surveying Cruise. 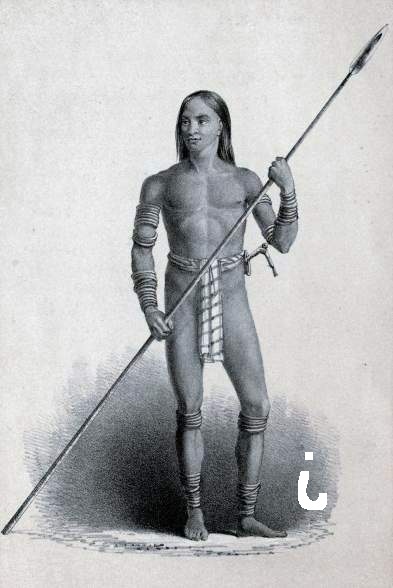 During the time that I was in the ship, I made a large collection of drawings, representing, I hope faithfully, the costumes of the natives and the scenery of a country so new to Europeans. They were considered, on my return, as worthy to be presented to the public, as being more voluminous and more characteristic than drawings made in haste usually are. I may here observe, that it has been a great error on the part of the Admiralty, considering the great expense incurred in fitting out vessels for survey, that a little additional outlay is not made in supplying every vessel with a professional draughtsman, as was invariably the case in the first vessels sent out on discovery. The duties of officers in surveying vessels are much too fatiguing and severe to allow them the time to make anything but hasty sketches, and they require that practice with the pencil without which natural talent is of little avail; the consequence is, that the engravings, which have appeared in too many of the Narratives of Journeys and[vi] Expeditions, give not only an imperfect, but even an erroneous, idea of what they would describe. A hasty pencil sketch, from an unpractised hand, is made over to an artist to reduce to proportion; from him it passes over to the hand of an engraver, and an interesting plate is produced by their joint labours. But, in this making up, the character and features of the individual are lost, or the scenery is composed of foliage not indigenous to the country, but introduced by the artist to make a good picture. In describing people and countries hitherto unknown, no description given by the pen will equal one correct drawing. How far I may have succeeded must be decided by those who have, with me, visited the same places and mixed with the people delineated. How I found time to complete the drawings is explained by my not doing any duty on board at one time, and at another by my having been discharged into the hospital-ship at Hong Kong. It was my intention to have published these drawings without letter-press, but in this I have been overruled. I have therefore been compelled to have recourse to my own private journal, which certainly was never intended for publication. As I proceeded, I found that, as I was not on board during the whole of the time, it would be better, and make the work more perfect, if I published the whole of the cruise, which I could easily do by referring to the journals of my messmates. I would gladly mention their names, and publicly acknowledge their assistance; but, all things considered, I think it as well to withhold them, and I take this opportunity of thanking them for their kindness. On the 25th of January, 1843, H. M. S. Samarang, being completely equipped, went out of Portsmouth harbour and anchored at Spithead. The crew were paid advanced wages; and, five minutes after the money had been put into their hats at the pay-table, it was all most dexterously transferred to the pockets of their wives, whose regard and affection for their husbands at this peculiar time was most exemplary. On the following day, the crew of the Samarang made sail with full hearts and empty pockets. On the 25th February, sighted Fuerto Ventura: when off this island, the man at the mast-head reported a wreck in sight, which, as we neared it, appeared to be the wreck of a brig. Strange to say, the captain recognised it as an old acquaintance, which he had seen off Cape Finisterre on his return from China in the Sulphur. If this was not a mistake, it would be evidence of a southerly current in this quarter of the Atlantic. This may be, but I do not consider the proof to be sufficient to warrant the fact; although it may lead to the supposition. If this was the wreck seen at such a long interval by the captain, a succession of northerly winds and gales might have driven it down so far to the southward without the assistance of any current. It is well known that the great current of the Atlantic, the gulf stream (which is occasioned by the waters, being forced by the continuous trade winds into the Gulf of Mexico, finding a vent to the northward by the coast of America, from thence towards Newfoundland, and then in a more easterly direction), loses its force, and is expended to the northward of the Western Islands; and this is the cause why so many rocks have been yearly reported to have been fallen in with in this latitude. Wrecks, all over the Atlantic, which have been water-logged but do not sink, are borne by the various winds and currents until they get into the gulf stream, which sweeps them along in its course until they arrive to where its force is expended, and there they remain comparatively stationary. By this time, probably, years have passed, and they are covered with sea-weeds and barnacles, and, floating three or four feet out of the water, have every appearance of rocks; and, indeed, if run upon on a dark night, prove nearly as fatal. March 3rd.—Anchored off the town of Porto Praya, Island of St. Jago, in nine fathoms. Porto Praya is a miserable town, built on a most unhealthy spot, there being an extensive marsh behind it, which, from its miasma, creates a great mortality among the inhabitants. The consul is a native of Bona Vista: two English consuls having fallen victims to the climate in quick succession, no one was found very willing to succeed to such a certain provision from the Foreign Office. The interior of the island is, however, very different from what would be expected from the sight of Porto Praya. Some of the officers paid a visit to the valley of St. Domingo, which they described as a perfect paradise, luxuriant with every tropical fruit. Porto Praya is renowned for very large sharks. I was informed by a captain in Her Majesty’s service, that once, when he anchored at Porto Praya, he had left the ship to go on shore in one of the twenty-two-foot gigs, not unaptly nick-named coffins in the service. He had not pulled more than a cable’s length from the ship, when a shark, nearly as long as the gig, came up swimming with great velocity after them; and as he passed, the animal shouldered the boat, so as nearly to upset it: as it was, the boat took in the water over the gunwale. As the animal appeared preparing for another attack, the captain thought it advisable to pull alongside, and go on shore in the cutter instead of his own boat; and on this large boat the shark did not make a second attempt. April 25th.—Anchored in Simon’s Bay, Cape of Good Hope. Sailed again on the 7th of May, and fell in with a favourable wind; and too much of it. For six days we were scudding before it under a close-reefed main-topsail and fore-staysail. On the 10th we lost one of the best men in the ship, the sailmaker, Charles Downing, who fell overboard; the ship was rounded to, the life-buoy let go, but we saw nothing of him. June 7th saw Christmas Islands, and on the same afternoon the land of Java. On the 11th we arrived off the town of Anger, in company with a fleet of merchant vessels of all nations and of all rigs. Having been so long without a fresh meal, we were not sorry to find ourselves surrounded by boats loaded with fish, fruit, and vegetables; we ate enormously, and they made us pay in proportion. On the 19th we arrived at Sincapore, and found the roads very gay with vessels of all descriptions, from the gallant free trader of 1000 tons to the Chinese junk. As Sincapore, as well as many other places, was more than once visited, I shall defer my description for the present. 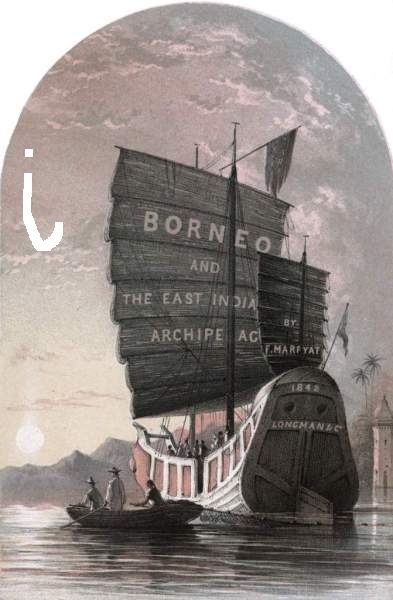 On June the 27th we weighed and made sail for the river of Sarawak (Borneo), to pay a visit to Mr. Brooke, who resides at Kuchin, a town situated on that river. The public have already been introduced to Mr. Brooke in the volumes published by Captain Henry Keppel. Mr. Brooke is a gentleman of independent fortune, who was formerly in the service of the Company. The usefulness and philanthropy of his public career are well known: if the private history which induced him to quit the service, and afterwards expatriate himself, could with propriety, and also regard to Mr. Brooke’s feelings, be made known, it would redound still more to his honour and his high principle; but these I have no right to make public. Mr. Brooke, having made up his mind to the high task of civilising a barbarous people, and by every means in his power of putting an end to the wholesale annual murders committed by a nation of pirates, whose hands were, like Ishmael’s, against every man, sailed from England in his yacht, the Royalist schooner, with a crew of picked and tried men, and proceeded to Sarawak, where he found the rajah, Muda Hassein, the uncle to the reigning sultan of Borneo, engaged in putting down the insurrection of various chiefs of the neighbouring territory. Mr. Brooke, with his small force, gave his assistance to the rajah; and through his efforts, and those of his well-armed band, the refractory chiefs were reduced to obedience. 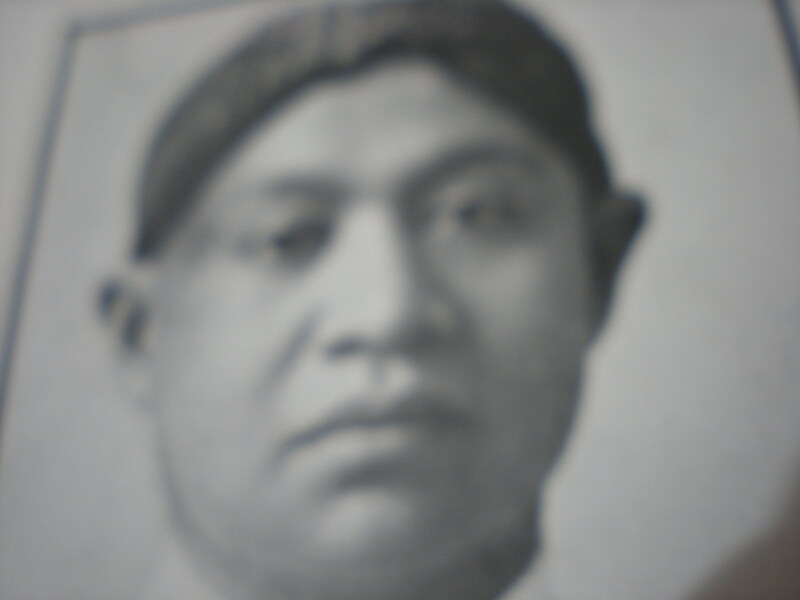 Willing to retain such a powerful ally, and partial to the English, the rajah made Mr. Brooke most splendid promises to induce him to remain; but the rajah, like all Asiatics, did not fulfil the performance of these promises until after much delay and vexation to Mr. Brooke, who required all the courage and patience with which he is so eminently gifted, before he could obtain his ends. At last he was successful: Muda Hassein made over to him a large tract of land, over which he was constituted rajah, and Mr. Brooke took up his residence at Kuchin; and this grant was ultimately confirmed by the seal of the sultan of Borneo. Such, in few words, is the history of Mr. Brooke: if the reader should wish for a more detailed account, I must refer him to Capt. 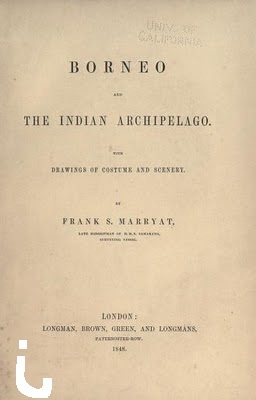 Henry Keppel’s work, in which is published a great portion of Mr. Brooke’s own private memoranda. THE END OF SAMPLE @COPYRIGHT Dr IWAN S 2010.